Under President Obama the bilateral relationship between the United States and Vietnam flourished. Despite some misgivings about the future direction of US policy in the region under President Trump, Hanoi is working hard to ensure that the relationship continues to expand. With the key elements of President Trump’s Southeast Asia policy still unclear, the president’s visit to the region comes at a critical moment. This is especially the case for Vietnam whose bilateral relationship with its former adversary, the United States, developed significantly under the Obama administration. While Hanoi was disappointed with President Trump’s abandonment of the Trans-Pacific Partnership, there are strong signs that the relationship will continue along a positive trajectory. Under the Obama administration, the US–Vietnam relationship expanded, especially in terms of security cooperation. China’s increasing assertiveness in the South China Sea has helped to warm US–Vietnam bilateral ties. The Trans-Pacific Partnership also offered Vietnam an opportunity to escape China’s economic orbit. But just as the hard-earned security rapprochement was starting to gain momentum, newly elected US President Donald Trump announced the US withdrawal from the Trans-Pacific Partnership. Soon after the rebalance to Asia was declared officially dead. Neither was good news for Vietnam. Despite initial anxiety over Trump’s reluctance to engage with Southeast Asia, there have been some positive signs that the relationship will continue to prosper. High-level meetings have helped to reassure Hanoi that the Trump administration has an interest in deepening bilateral relations. President Trump’s attendance at the APEC Summit in November 2017 in Da Nang and a scheduled side trip to Hanoi will be important signals of how President Trump views what has become one of the United States’ most important emerging relationship in Southeast Asia. The US–Vietnam relationship has undergone a major transformation since relations between the two countries were normalised in 1995. While building trust between these two former adversaries has not been easy, in recent years China’s increasing assertiveness in the South China Sea has helped accelerate the warming of bilateral ties. The election of Donald Trump as US president, however, has raised questions about whether the efforts of the Obama administration to strengthen the relationship will continue. One of President Trump’s first acts in office was to withdraw from the Trans-Pacific Partnership, an agreement that was important economically and politically to Vietnam. Hanoi also has doubts about whether the new administration shares its security concerns about Chinese activities in the South China Sea. President Trump’s visit to Vietnam to attend the Asia-Pacific Economic Cooperation (APEC) Summit in November 2017 has, therefore, assumed a great deal of significance and will play a major role in setting the tone and terms for the relationship in coming years. The aim of this Analysis is to examine whether the positive trajectory of US–Vietnam relations under the Obama administration is likely to continue under his successor. It examines some of the key drivers and elements of the relationship under Obama before turning to a discussion of the main factors likely to shape the relationship under Trump. During a visit to Vietnam in 2013, US Secretary of State John Kerry said that no two countries “have worked harder, done more, and done better to try to bring themselves together and change history and change the future”. Indeed, the post-war rapprochement between Vietnam and the United States did not come easily on either side. The early years of normalisation under the Clinton administration were paced to respond to domestic sensitivities, still strong within Congress. Much of the initial focus was on trade. In 1994 President Clinton lifted the trade embargo against Vietnam and not long after the normalisation of diplomatic relations in 1995 the two governments signed the Bilateral Trade Agreement. This paved the way for the steady and substantial growth of trade between the two economies, with an increasingly favourable balance of trade for Vietnam. In 2006 the US Congress accorded Vietnam permanent normal trade relations status, which represented the completion of normalisation of economic ties, and allowed Vietnam to join the World Trade Organization (WTO) in 2007 as its 150th member. During this period Hanoi remained cautious about expanding military cooperation with the United States. Even after the significant warming of ties under the Obama administration, Vietnam declined an invitation by US Defense Secretary Ash Carter for Vietnamese military officers to observe P8 Poseidon maritime patrols over the South China Sea. Vietnam is among only three ASEAN members, along with Myanmar and landlocked Laos, which do not participate in CARAT (Cooperation Afloat Readiness and Training) exercises run by the US Pacific Fleet. The slow evolution of military-to-military relations reinforced a feeling in Washington that Hanoi was reluctant to take the relationship further. Vietnamese defence policy has traditionally been quite conservative, with strong emphasis on self-reliance. The so called ‘three no’s’ — no to foreign military bases; no to foreign military alliances; and no to using a third country to oppose another — have been the key elements of its defence strategy. This policy was adopted in the aftermath of Vietnam’s normalisation with China in 1991. It was intended to reassure Beijing that Hanoi had no hostile intent towards it. To date, Vietnam’s single most important relationship remains with China. It is a complex relationship that is determined by a vast power disparity, but also some political and economic affinity, extensive trade exchange, a long history of interaction, and a geographical proximity that some refer to as a curse. “Vietnam views China as the inscrutable northern giant”, writes Brantly Womack in China and Vietnam: The Politics of Asymmetry. “Even at peace the giant is feared because the fateful decision of war or peace is largely in the giant’s hand.” Adding to the already challenging circumstances of power asymmetry, Vietnam and China have conflicting claims in the South China Sea. The neighbours have made efforts to address the sovereignty tensions through regular communication via a variety of channels, including Party-to-Party talks, defence ministers’ dialogues, and the establishment of a maritime hotline. Vietnam’s Deputy Prime Minister and Foreign Minister Pham Binh Minh has described five ways in which the country has tried to protect and assert its interests in the South China Sea. These include: holding regular dialogues between Vietnamese and Chinese government officials, communist party functionaries and military officers; supporting the 2002 ASEAN Declaration on the Conduct of Parties in the South China Sea, which it hopes it can eventually develop into a Code of Conduct; internationalising the South China Sea dispute by raising awareness about it in regional and international forums; accelerating defence modernisation programs with an emphasis on improving the military’s air and naval capabilities; and diversifying its foreign relations by expanding partnerships with a broad range of countries. In May 2014, China National Offshore Oil Corporation deployed a mobile oil rig, HYSY-981, inside Vietnam’s exclusive economic zone. The move took Hanoi by surprise, severely undermining its hard-earned trust. The rig remained stationed in waters around the Paracel Islands for a number of weeks, raising tensions between the two countries. China eventually withdrew the oil rig, but the incident had a major impact on Hanoi’s view of Beijing’s ambitions in the region and injected greater urgency into Hanoi’s efforts to seek external partners to balance China. The most important development in the South China Sea dispute since the HYSY-981 incident was the ruling of the arbitral tribunal in The Hague in July 2016 on the case brought by the Philippines against China concerning China’s behaviour in the South China Sea. The court ruled that China’s artificial islands had no legal status and the exclusive economic zone of 12 nautical miles could not be applied to them. The ruling was a moral victory for Manila, but as well as for all other claimants in the South China Sea. Vietnam was one of only seven countries — including the Philippines, Australia, Canada, Japan, New Zealand, and the United States — that openly welcomed the ruling and called for compliance. Other countries, including a number of Vietnam’s fellow ASEAN members, adopted a far more cautious approach, fearing how China might respond. Vietnam has emerged as the main remaining protagonist in Southeast Asia on the South China Sea issue. This has not earned it points in Beijing. In June 2017 China reportedly pressured Vietnam to cease gas exploration operations by Talisman-Vietnam, a subsidiary of Spanish company Respol, operating in a region called Block 136-03 (around 400 kilometres from Vietnam’s shoreline). General Fan Chanlong, Vice-Chairman of China’s Central Military Commission, cut short his visit to Vietnam before a scheduled bilateral meeting on border defence. A few weeks later the Vietnamese withdrew from Block 136-03 after China threatened it militarily. This unusual act of accommodating Chinese pressure provoked domestic criticism of the Vietnamese regime. Some observers argued that the decision was rational given Hanoi’s limited options. Others saw it is a tactical retreat to avoid a major confrontation ahead of the 2017 APEC Summit, which will be hosted by Vietnam. Vietnam’s growing concern about China is not the only reason its relationship with the United States has warmed. The strengthening of bilateral ties with the United States is part of a longer-term process in which Vietnam has sought to diversify its international relationships. It was not that long ago that Vietnam was isolated internationally. As soon as its war with the United States ended it went on to fight conflicts with its neighbours Cambodia and China. A decade later its only remaining ally, the Soviet Union, collapsed. Vietnam has learned from historical experience that over-reliance on one partner can be dangerous. Having been isolated in the past it has tried to expand its range of bilateral and multilateral partnerships. Hanoi quickly recognised the importance of the Association of Southeast Asian Nations (ASEAN). Greater cooperation with ASEAN has been a key pillar of Vietnamese foreign policy since its accession in 1995. Vietnam’s efforts to more closely integrate with the group have largely been successful and it has become a key member. The current Secretary-General of ASEAN, Le Luong Minh, is the first Vietnamese national to assume this position. Outside of ASEAN, Japan and India have emerged as key partners. Since the HYSY-981 crisis Vietnam’s exchanges with Tokyo have increased. Levels of trust between the two countries are strong given that Japan has consistently been one of the top foreign investors in and aid donors to Vietnam. A strategic partnership agreement was signed in 2006, which has since been upgraded to a comprehensive strategic partnership, and a defence cooperation agreement was signed in 2011. In the aftermath of the oil rig stand-off, Tokyo provided Vietnam with six second-hand offshore patrol ships. Regular visits by both countries’ prime ministers and defence ministers has helped to sustain the momentum. Tighter collaboration with Japan has two benefits for Vietnam. It is a way for Vietnam to gradually increase its level of comfort in drawing closer to the United States and its network of allies in the region. It also provides an alternative to becoming solely dependent on the United States. In other words, closer relations with Japan helps Vietnam to balance China, to reinforce its military capabilities, and strengthen its economy without going through the ideological and historical trauma of rapidly strengthening ties with the United States. If the momentum continues, the relationship has the potential to become a trilateral US–Japan–Vietnam relationship. India and Vietnam signed a strategic partnership in 2007, which was also subsequently upgraded to a comprehensive strategic partnership. The oil rig incident has added to the impetus for bolstering bilateral ties. During a visit to Delhi by Vietnam’s then prime minister, Nguyen Tan Dung, in October 2014, the two countries agreed to expand cooperation in a number of areas including defence, energy, trade and investment, and space. India also offered to provide training for Vietnam’s Navy. It is against the background of these developments that Vietnam’s evolving relations with the United States need to be viewed. In 2010, during a meeting of the ASEAN Regional Forum in Hanoi, US Secretary of State Hillary Clinton said that the United States had a national interest in the South China Sea and supported the peaceful resolution of the disputes. She implicitly addressed China in her statement, saying the United States “oppose[s] the use or threat of force by any claimant” and that “legitimate claims to maritime space in the South China Sea should be derived solely from legitimate claims to land features”. The speech was something of a breakthrough in US–Vietnam relations. It was very well received in Hanoi, which considered the content of the speech and the fact that it was made in Hanoi a diplomatic victory. Just a month after Clinton’s speech, Vietnam and the United States launched the first annual, deputy ministerial-level defence and strategic dialogue in Hanoi. The same year the US 7th Fleet conducted joint training exercises with the Vietnamese Navy. Since then the two countries have conducted regular training exercises focused on search and rescue, environmental security, and clearing leftover landmines and unexploded ordnance. Under the Obama administration Vietnam was one of only three countries in Southeast Asia that saw an increase in US defence assistance. In 2011 Hanoi and Washington signed a Memorandum of Understanding on Advancing Bilateral Defence Cooperation, which committed to high-level regular defence dialogues and cooperation in maritime security, as well as cooperation in peacekeeping, humanitarian assistance, and disaster relief. In 2012 for the first time since the Vietnam War, the US Defense Secretary visited the civilian port at Cam Ranh Bay. During that visit, he established an Office of Defense Cooperation at the US Embassy in Hanoi. Vietnam became an observer at the Rim of the Pacific Exercise (RIMPAC-2012) — the largest navy exercise in the world. These developments were an essential backdrop to then President Truong Tan San’s visit to Washington in 2013, when a “comprehensive partnership” agreement was signed between the two nations. The agreement was a milestone reflecting the new levels of confidence and trust between the former adversaries and paving the way for further efforts to deepen the relationship. That same year Secretary of State John Kerry visited Vietnam and announced a $18 million assistance package to improve the country’s ability to conduct coastal patrol, search and rescue, and disaster relief operations. This included the provision of five patrol vessels to the Vietnamese Coast Guard. Following the HYSY-981 incident the United States partially lifted its restrictions on lethal weapon sales to Vietnam. The economic relationship has also expanded. In particular, the Trans-Pacific Partnership, the key economic component of the Obama administration’s rebalance to Asia, promised to draw Vietnam’s economy closer to that of the United States. For Vietnam, the Trans-Pacific Partnership was not just important in economic terms, it also carried an important strategic meaning because it was an opportunity for Vietnam to diversify its economy away from its reliance on China. Whereas in the past Hanoi had viewed the relationship with the United States with considerable caution and mistrust, a new tone was struck in this period. Prominent Vietnamese intellectuals began openly advocating a tighter association with the United States on the grounds that “national interests were bigger than history and ideology”. In 2015 Vietnam’s Communist Party General Secretary Nguyen Phu Trong paid a formal visit to Washington and met with President Obama. It was the first time a head of the ruling Communist Party of Vietnam had a formal meeting with the US president in the Oval Office of the White House. The involvement of the Party General Secretary in diplomatic initiatives is relatively rare. His visit signalled that the need for deepening relations with the US had been socialised even within the more conservative circle of the Party. The reference to non-militarisation was particularly important to Vietnam given this issue had traditionally been cautiously avoided in official ASEAN statements. The fact that it was the same place where Obama had held a summit meeting with Chinese President Xi Jinping reassured ASEAN leaders that the United States was not going to sacrifice their interests for the sake of the China relationship. President Obama’s personal charisma was another key factor in improving the image of the United States in Vietnam, not just with the public but also with policymakers. During his visit in May 2016 he was warmly welcomed on the streets of Hanoi and Ho Chi Minh City. In a speech in Hanoi Obama skilfully tapped into a small state’s psychology by reiterating that every nation was equal regardless of size. He acknowledged Vietnam’s strategic anxiety in relation to China while reassuring the Vietnamese leadership that the United States had no intention of interfering in its domestic arrangements. Obama’s decision to announce the total annulment of the ban of lethal weapons sales to Vietnam during the visit was also very well received. Obama justified the decision as a way to “ensure that Vietnam has access to the equipment it needs to defend itself”. The decision was in many ways the logical end of the normalisation process between the two countries, but also the start of a new chapter in geostrategic relations in the Asia-Pacific. In theory it enables Vietnam to diversify the sources of its military equipment. Any shift will likely be a gradual one, however, not least given the language and training barriers to procuring equipment from new sources. Nevertheless, Vietnam has a growing need for surveillance equipment including maritime patrol and reconnaissance aircraft as well as command and control equipment, which could be met by US defence suppliers. Given how closely President Obama was associated with the deepening of US–Vietnam ties, the change of administrations in the United States has inevitably raised questions about the future of the relationship. From Hanoi’s perspective, some of the Trump administration’s early moves have raised alarm bells, most notably its withdrawal from the Trans-Pacific Partnership. It was a major disappointment for Vietnam. Moreover, despite the Trump administration’s continuation of freedom of navigation operations, there is a perception in Hanoi that the South China Sea issue figures relatively low in Trump’s foreign policy priorities. In fact, after nine months in office, and amid growing tension in the region, there is little sign that Trump is formulating a comprehensive strategy for Asia. The North Korean nuclear crisis has absorbed most of Washington’s attention when it comes to Asia. Moreover, Trump’s initial talks with Chinese President Xi Jinping has led some in Southeast Asia to fear that a softer US line on the South China Sea could be traded for Beijing’s cooperation on North Korea. Despite its concerns, the Vietnamese leadership has been proactive in pursuing direct engagement with the new president. 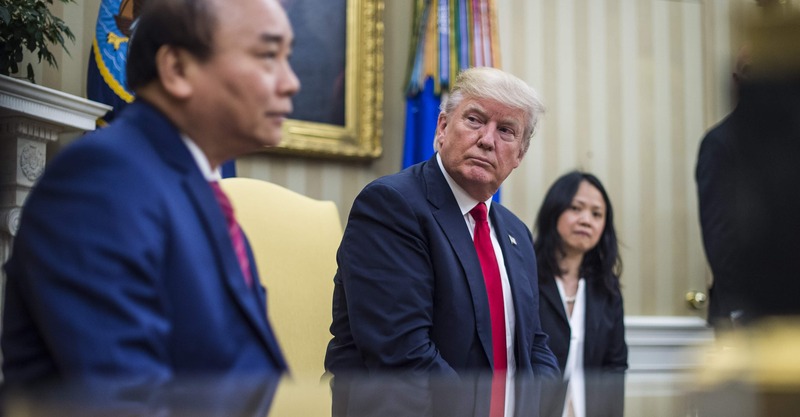 In May 2017 the Vietnamese Prime Minister Nguyen Xuan Phuc was the first Southeast Asian head of state, and the third from Asia (after Japanese Prime Minister Shinzo Abe and Chinese President Xi Jinping) to visit President Trump after he took office. The meeting was considered successful and set a positive tone for the relationship under the new administration. The mention of national sovereignty was very well received in Vietnam as a strong signal of Washington’s support. It is possible that as a follow-up to the meeting a US aircraft carrier may dock at Cam Ranh Bay in 2018. It will be the first time a US warship has visited the port since the Vietnam War. Military cooperation has also accelerated. In May 2017 the US Pacific Partnership 17 — a multilateral mission aimed at enhancing regional coordination in medical readiness and preparedness for man-made and natural disasters — visited Khanh Hoa and Da Nang in central Vietnam. In the same month, the United States transferred a former US Coast Guard Hamilton-class high-endurance cutter to Vietnam. In July, Washington and Hanoi conducted the 8th Naval Engagement Activity. The United States is also providing support for Vietnam’s participation in UN peacekeeping operations. All of these activities illustrate how habits of cooperation are gradually but steadily building between the two countries. The current eagerness to cooperate on the Vietnamese side is noticeably stronger compared with a few years ago. The one major question mark about the US–Vietnam relationship revolves around the demise of the Trans-Pacific Partnership. The Trans-Pacific Partnership was important to Vietnam in two ways: it was a way to draw closer to the United States economically; while at the same time drifting away from China’s economic orbit. When the Vietnamese Communist Party Secretary General Trong visited Washington in July 2015, he committed Vietnam to carry out “whatever reforms were necessary” to implement the agreement. This alone testified to the importance of the trade deal not only to the political and economic future of Vietnam but also as a mechanism for fostering “strategic trust” with the United States. President Trump’s decision to abandon the Trans-Pacific Partnership was therefore deeply disappointing for Vietnam. Vietnam is participating in efforts by other partners to conclude an agreement without the United States. The Vietnamese side has discussed its hopes of negotiating a bilateral free trade agreement with the United States. Any free trade agreement would, however, be difficult to negotiate, particularly given Trump’s view on trade. Nevertheless, the economic dimension of the relationship is of particular importance to Vietnam, as maintaining a strong economy determines its strategic calculus. Hanoi’s challenge is to convince President Trump that Vietnam is a highly prospective market for US investments. The APEC Summit, with its focus on trade and economic governance, will be an important opportunity to do that, along with the bilateral exchange that will occur in parallel to the Summit. For several years there has been discussion of elevating the comprehensive partnership between Vietnam and the United States to some form of strategic partnership. In the aftermath of the HYSY-981 oil rig incident, some even suggested that Vietnam should seek an alliance arrangement with the United States. The idea of a strategic partnership was mooted as far back as Hillary Clinton’s visit to Hanoi in 2010, but the idea was considered premature. There are challenges to agreeing on a strategic partnership, including the ‘thin’ defence ties between Washington and Hanoi compared with the ties that Washington has with Singapore or even Kuala Lumpur. However, the enthusiasm on both sides does not exclude such development. While neither the United States nor Vietnam are likely to seek a formal alliance along the lines of US arrangements with Thailand, the Philippines, or Australia, a more flexible strategic partnership — similar to the one with Singapore — is a feasible model. It would require further commitments from both sides. The United States would be expected to play a bigger role in strengthening the capacity of Vietnam’s defence force — including supplying hardware and defence technology. Vietnam would be expected to reciprocate. One possibility would be for it to provide the US Navy with access to the Cam Ranh Bay naval base. Cam Ranh Bay is considered the finest deep-water shelter in Southeast Asia. It served as a naval and air base for US forces during the Vietnam War. So far, the United States, like other countries, including China, have had access to the commercial port at Cam Ranh Bay. Only Russia has had privileged access to the naval base. US warship visits are also limited to one per year. Previously, Hanoi has rejected Washington’s proposal to host rotations of US troops and warships at the naval base, partly because of historical sensitivities. Another way for Vietnam to heighten the level of strategic cooperation would be to conduct joint patrols as well as join US freedom of navigation operations in the South China Sea. Not only would this be a robust response to China’s growing militarisation of the area, it would strengthen the security relationship with the United States. Over the longer term, an enhanced strategic relationship could see participation in exercises such as RIMPAC, although this would require a significant modernisation of Vietnam’s naval forces. Of course any of the above moves would provoke deep unease in China, something that would factor into both Vietnamese and US calculations. Such a dramatic makeover of the bilateral relationship is probably less likely than a gradual but steady growth in cooperation and engagement between the two countries. While President Trump’s attitude to Vietnam is still unclear, senior officials in his administration have been actively working to ensure that the Obama administration’s efforts to strengthen the relationship will continue. President Trump will be the first US president to visit Vietnam within his first year in office. Nevertheless, there are some difficult issues to be negotiated, chief among them the economic relationship. Ultimately, however, China will loom largest in both sides’ calculations. Vietnam is one of the few countries in the region prepared to adopt a tougher line on the South China Sea issue. Given Vietnam’s concern about China there has probably been no more propitious time for the United States to engage with Vietnam. In some respects, a further warming of the US–Vietnam relationship depends on a cooling of the China–Vietnam relationship and perhaps also the US–China relationship. Hanoi’s greatest fear, no doubt, would be a situation in which both relationships cooled at the same time. A part of this paper benefited from discussion at the Australia–Singapore–US policy trialogue on Southeast Asia hosted by the Australian National University, the S. Rajaratnam School of International Studies and Stanford University. Dr Huong Le Thu is a visiting fellow at the Coral Bell School of Asia Pacific Affairs at the Australian National University. Prior to the ANU, Huong worked in Singapore and Taiwan and has held short-term research fellowships in Seoul (private think tank), Kuala Lumpur (University of Malaya) and Jakarta (the ASEAN Secretariat). Huong is a recipient of a US State Department Fellowship on East Asian Security and an alumna of the Daniel K Inouye Asia-Pacific Center for Security Studies in Honolulu. She was awarded the inaugural fellowship of the IISS Shangri-La Dialogue Southeast Asian Young Leaders’ Program in 2016. Her research focuses on the nexus of domestic politics and foreign policy in Vietnam and Vietnam’s relations with great powers. She has also published on ASEAN norms. Huong speaks five languages (including Mandarin Chinese) and has published in four of them. John Kerry, “Remarks to Ho Chi Minh City Business Community and Fulbright Economic Teaching Program Participants”, Ho Chi Minh City, Vietnam, 14 December 2013, https://2009-2017.state.gov/secretary/remarks/2013/12/218721.htm. China is Vietnam’s biggest trading partner; however, it suffers huge trade deficits. Vietnam is dependent on China for supply of parts for most of its key exports. Carlyle Thayer, “The Tyranny of Geography: Vietnamese Strategies to Constrain China in the South China Sea”, Contemporary Southeast Asia 33, Issue 3 (2011), 348–369. Brantly Womack, China and Vietnam: The Politics of Asymmetry (Cambridge: Cambridge University Press, 2006), 9. Pham Binh Minh, “Thoughts on Shaping New Foreign Policy [Một số suy nghĩ về định hình chính sách đối ngoại mới]”, in Setting Direction for Strategic Diplomacy of Vietnam Toward 2020 [Định Hướng Chiến Lược Đối Ngoại Việt Nam đến 2020], Binh Minh Pham ed (Hanoi: National Political Publisher Nhà Xuất Bản Quốc Gia, 2010). “Vietnam–India Joint Statement”, VOVWorld, 15 September 2014, http://vovworld.vn/en-US/News/VietnamIndia-Joint-Statement/270814.vov. Hillary Clinton, “Remarks at Press Availability”, Hanoi, Vietnam, 23 July 2010, https://2009-2017.state.gov/secretary/20092013clinton/rm/2010/07/145095.htm. Restrictions on arms sales to Vietnam were in place after the Vietnam War ended in 1975. Since 1984 Vietnam has figured officially on the US list of International Traffic in Arms Regulations (ITAR). In 2007 the US State Department amendment allowed, on a case-by-case basis, licences, other approvals, exports or imports of non-lethal defence articles and defence services destined for or originating in Vietnam, but the conditions were tied to Vietnam’s human rights record. The twelve countries that signed up to the Trans-Pacific Partnership in 2016 are: Australia, Brunei, Canada, Chile, Japan, Malaysia, Mexico, New Zealand, Peru, Singapore, the United States, and Vietnam. VL Ngo, “Mỹ tuần tra Biển Đông: Việt Nam và Đông Nam Á cần tích cực ủng hộ” [The US Patrols in the South China Sea: Vietnam and Southeast Asia Should Actively Support], RFI, 26 October 2015, http://vi.rfi.fr/viet-nam/20151005-bien-dong-viet-nam-can-van-dong-du-luan-va-manh-dan-to-cao-trung-quoc. Rishi Iyengar, “US Will Lift Embargo on Arms Sales to Vietnam, President Obama Announces”, Time, 23 May 2016, http://time.com/4344468/obama-vietnam-arms-embargo-lifted-hanoi-us-war/. Huong Le Thu, “The Bilateral and Regional Significance of Obama’s Visit in Vietnam”, CSIS PacNet No 48, 2 June 2016, https://www.csis.org/analysis/pacnet-48-bilateral-and-regional-significa...’s-visit-vietnam. US Census Bureau, “Trade in Goods with Vietnam”, https://www.census.gov/foreign-trade/balance/c5520.html. Roberta Rampton and David Brunnstrom, “Trump Hails Deals Worth ‘Billions’ with Vietnam”, Reuters, 1 June 2017, https://www.reuters.com/article/us-usa-trade-vietnam-trump/trump-hails-deals-worth-billions-with-vietnam-idUSKBN18R30C. Le Thu, “High Hopes and a Big Let-down”.